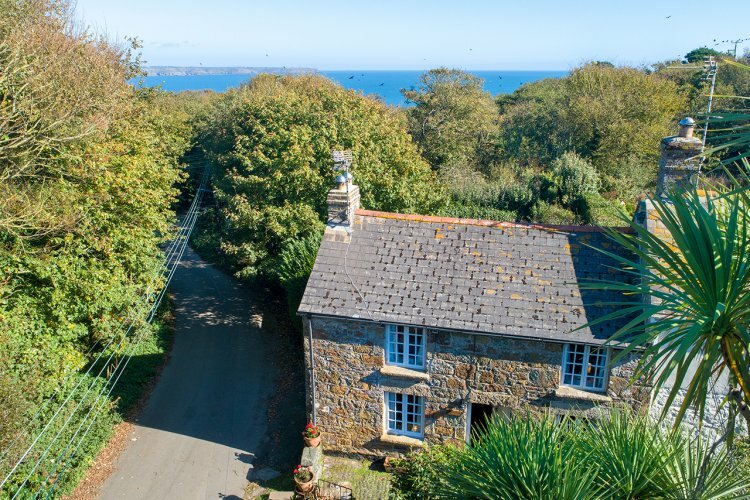 Hansey Cottage is situated half way between the Lizard village centre with its shops and pubs, and Church Cove where local fishing boats are hauled high up on the slipway, which is just a couple of minutes’ walk. The South West coast path can easily be picked up from here and is a great way to see the nearby beaches, coves and stunning vistas of the sea. You could walk to Cadgwith for lunch at The Old Cellars or The Cadgwith Cove Inn whilst watching the fishing boats land their catch on the shingle beach. Just over the road is the 12c St Wynwallow’s church where you can see the tower constructed of blocks of granite and serpentine that give it a chequerboard appearance. From the road there’s a step up onto the cobbled path and terraced front garden. Enter into the spacious living and dining room where the cottage's character continues with beamed ceiling, exposed stonework in the living area and wood floor throughout. Comfy seating nestles around the fireplace with a TV & Blu-ray player while the dining area has a table and four chairs. The newly fitted kitchen features integrated appliances including an electric oven, 4-ring induction hob, fridge/freezer, dishwasher and microwave as well as a kettle, toaster and Nespresso coffee pod machine. The utility room has a washing machine and leads to the ground floor bathroom which has a bath with mixer shower over, handbasin, toilet and heated towel rail. Upstairs, the main bedroom has a double bed, bedside tables with lamps, built-in storage cupboard, chest of drawers and a handbasin unit. The second bedroom has twin beds, wardrobe and chest of drawers. The back garden has a lawn and patio area with table and chairs surrounded by greenery, perfect for sitting out with an afternoon refreshment. On road parking may be available next to the cottage although it isn’t an official space. A small free car park is also just over the road. Rental includes bedlinen, utilities, central heating and WiFi. One dog welcome by prior arrangement of £25 per week.